As the twenties century draws to a close, major characteristics of this century’s art remain: the strong claims of personality and a search for an art that is concerned more with its own coming into being than with the perception of reality. Freed from extraneous meanings, obligated only to itself, art has no longer the function to reconstruct perceptions of reality, but rather to serve an individual reality of form; it is in fact obligated to culture rather than to nature and is thus able to make a theme of individual perception. Abstract processes are oblique, however it is exactly here that new functional possibilities open up for abstract art, which go well beyond the commonplace of extreme subjectivity. A representative of this new potential is the Irish artist John Noel Smith. He is a nonobjective painter, an abstract painter, for whom an abstract form is always a form within the context of ideas, a podium for the non-portrayable, for notions that exist only in thought. He consciously follows a tradition characterised by the use of symbols, while abstaining from the objective use of figures; his images are “dissimilar images” or in the language of art historians imago dissimilis. John Noel Smith presents us with an image of the confrontation between metaphysics and the possibilities of an artistic idiom. How should we decipher the work of this artist? His paintings are never inaccessible; on the contrary, they allow us one foot inside the door from the beginning, provided that we are receptive to the picture’s simple forms and symbols. John Noel Smith’s art can best be characterised as a complex process of perception, not to be understood at a glance, but during and after several approaches. As in Knots, where the line resembles a romantic arabesque emerging from a coloured background, we find in the painting Palimpsest (1997, 230 x 290 cm) a division into two levels of perception. The idiom is quieter, but the method is the same. Once again we find a slumbering symbolism upon a foundation of layered colour, only here the layers of colour are built up on the same hue; thus the surface – with its layered construction, its transparency – appears more vivid. It bears witness to the painting process and at the same time sets up what could be called a field of contemplative projection. The smaller black and white flat shapes together with the whole refer us in turn to the title. They symbolise a palimpsest, a parchment or a tablet that has been written upon or inscribed two or three times, the previous text to texts, having been imperfectly erased and remaining, therefor, still partly visible. Literally, the Greek palimsestos means “rubbed again”. The idea incorporated in these paintings is the endeavour to return to one’s own original vocabulary. 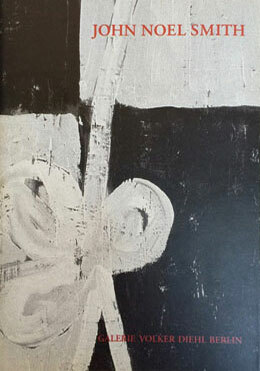 In this painting, as in the Ogham series, the artist is concerned with the notion of an idiom of his very own. Primal Painting (1997, 270 x 150 cm) and Ogham (1998, 135 x 150 cm) play symbolically with the idea of the alphabetic system of Old Irish, in which the letters are represented by various combinations of lines or notches as carved along the edge of a memorial stone. Again we have a layered background, in white, however the interplay between the sensual and the intellectual blends more neatly. In this way the artist has found a formal equivalent for the embossment upon the stone. Perhaps more so than in Palimpsest, there is an emphasis on the search for expression, on symbols used to describe symbols. For John Noel Smith the symbol of a return to a primal language is equally an image of a return to the sources of the art of painting and thus to the earliest source of man’s striving towards expression. These paintings aim high, inching cautiously towards a notion of something vital to men and women, dealing alike with change, with continuity. John Noel Smith – Paintings 1997 -1998.